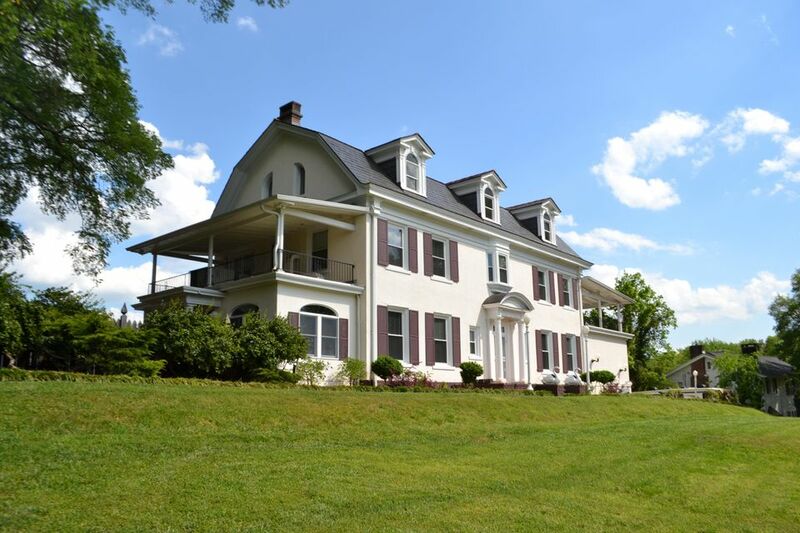 Impressive upon entry, this historic 1890's home is perfectly situated on approximately 1.78 acres atop Missionary Ridge with a heated, in-ground, Gunite, salt water pool set among beautiful landscaping with a scenic view and offers both elegance and comfort, making it perfect for both formal and informal entertaining. The home has been lovingly maintained, and you will find many updates, including the recently installed teak hardwoods throughout much of the main level, the gourmet kitchen, modernized powder room, fresh paint in many areas, resurfaced pool deck, renovated pool house, workshop with full bath, newer widened driveway, partially re-built retaining walls, new shed roofs on either side of the house, energy efficient windows, HVAC's - just to name a few! The interior boasts a gracious foyer with elevator and powder room under the stairs, and it opens to the large living room adorned with a crystal chandelier and gas log fireplace. Enjoy quiet evenings in the handsome adjoining study with French doors, cherry paneled walls, coffered ceiling and access to the side raised garden beds. The lovely formal dining room also has a gas log fireplace and is conveniently located just off of the kitchen which has newer custom cabinetry with soft-close doors, granite counter tops, center island with decorative lighting, great storage and pop-up electrical outlets, steam and convection Thermador wall ovens and downdraft cook top, wine cooler, ice maker, spice storage and more! The breakfast room has a great coffee bar and overlooks the rear patio and pool area. Have fun playing pool or just relaxing in the spacious rec room/family room with walls of built-ins, skylights and arched windows to the kitchen. All of the bedrooms and full baths are on the second level, including the master bedroom which has a walk-through bath to an additional bedroom which would make a great nursery or fabulous walk-in closet. There are 2 more dedicated bedrooms and a hall bath plus an office with built-ins, a closet and elevator access which would could be converted to a 5th bedroom if desired. The third level was once a ball room and now is the perfect media or bonus room with multiple dormers with window seats and tons of walk-out storage. Usher in warm summer days in the beautiful back yard and around the pool with scenic views while enjoying the pool house which has a kitchenette/refreshment center, a full bath and sliding glass doors that open to the covered patio area. Extras include the 3 car garage, generous basement storage and workshop area with a 1/2 bath, elevator, intercom, large gazebo with hot tub*, separate workshop that was once a guest apartment and has a full bath and basement area with access in back, ample parking, fenced back yard and a truly serene setting. You must see this one for yourself to appreciate all that it has to offer. Call for your private showing today! Information is deemed reliable but not guaranteed. Buyer to verify any and all information they deem important. © 2019 Chattanooga Multiple Listing Service. All rights reserved. The data relating to real estate for sale on this web site comes in part from the Internet Data Exchange Program of CHTMLS. Real estate listings held by IDX Brokerage firms other than Re/Max Renaissance Realtors are marked with the Internet Data Exchange logo or the Internet Data Exchange thumbnail logo and detailed information about them includes the names of the listing brokers. Information provided is for consumers' personal, non-commercial use and may not be used for any purpose other than to identify prospective properties the viewer may be interested in purchasing. Re/Max Renaissance Realtors does not display the entire MLS of Chattanooga, Inc. database on this website. The listings of some real estate brokerage firms have been excluded. Information provided is deemed reliable, but not guaranteed. Data last updated: Thursday, April 18th, 2019 at 08:59:46 AM. Listing courtesy of Keller Williams Realty.